The more novel the invention, the less likely it is to fit the status quo. True breakthroughs require systemic overhaul — some combination of custom infrastructure, complementary technologies, and process reform — to activate their full potential. This, of course, doesn’t happen overnight. Sometimes, it can take decades. As innovators, it’s easy to get frustrated with a slow start, but it would be a mistake to get discouraged. If anything, we should be taking the lag as a compliment. It may be confirmation that we’re onto something big. After all, many of the technologies we’ve come to view as revolutionary fell flat before we learned how to make the most of them. Knowing this history should inspire us to seek out ways to create the environments our own technologies will need to thrive. Economic historians call inventions powerful enough to transform how we live and work “general-purpose technologies” (GPTs). These are the major game changers, like the printing press, the iron steamship, and the internal-combustion engine. They represent monumental leaps in technology whose influence spills over into surrounding frameworks and society at large. It takes businesses and institutions being reinvented to leverage their strengths for GPTs to live up to their promises. One classic example is the electric dynamo. When electricity was first introduced as a commodity in the early 1880s, its value proposition was obvious. Factories powered by steam engines had no ability to direct power and were, therefore, burning coal at “full steam” whether running their whole operation or just a single machine. Electric dynamos would allow for targeted delivery of power, which promised to greatly impact efficiency. Electric power would also create a much safer environment for factory workers, who were regularly getting snatched up by loose sleeves or pant legs and eaten alive by the merciless spinning shafts, cogs, and belts of the factory machines. Factory owners were sold on electrification. Yet, as they began to make the switch, initial results were less than satisfactory. Costs didn’t seem to be going down by much, and the decrease in worker mortality rates was underwhelming, if not negligible. While this appeared to be inconsistent with the advantages of the newly introduced technology, Thomas Edison, Father of Electricity, understood what was going on. Edison’s invention philosophy prioritized systems over individual components. The way he saw it, the difference between proving the practicability of a system and introducing it for general use was the plan for infrastructure. Edison didn’t stop at the lightbulb; he understood he would have to invent the ecosystem for it to inhabit, so he created the regulators, meters, switches, fuses, fixtures, underground conductors with their necessary connecting boxes, and a host of other details, down to insulating tape. The notions underlying the Edisonian systems approach would have suggested that electric generators, too, could never hack it alone. Replacing central steam engines could not have been enough to effect change because the true advantages of electric power could not be retrofitted to the steam-powered factory. To fully harness the power of the dynamo, factories had to reorganize. Almost half a century would go by before these systems were optimized for electric motors. However, once that happened, sure enough, the motors delivered on their intended benefits. By the 1920s, thoughtful changes to factory architecture and hiring values had tailored production systems to allow electricity to demonstrate what it could do for industry in America, triggering a remarkable burst of productivity that would continue into the 1950s. Fast forward sixty-some-odd years, and another notable GPT was struggling to get off the ground. In the 80s, everyone was betting on the personal computer. 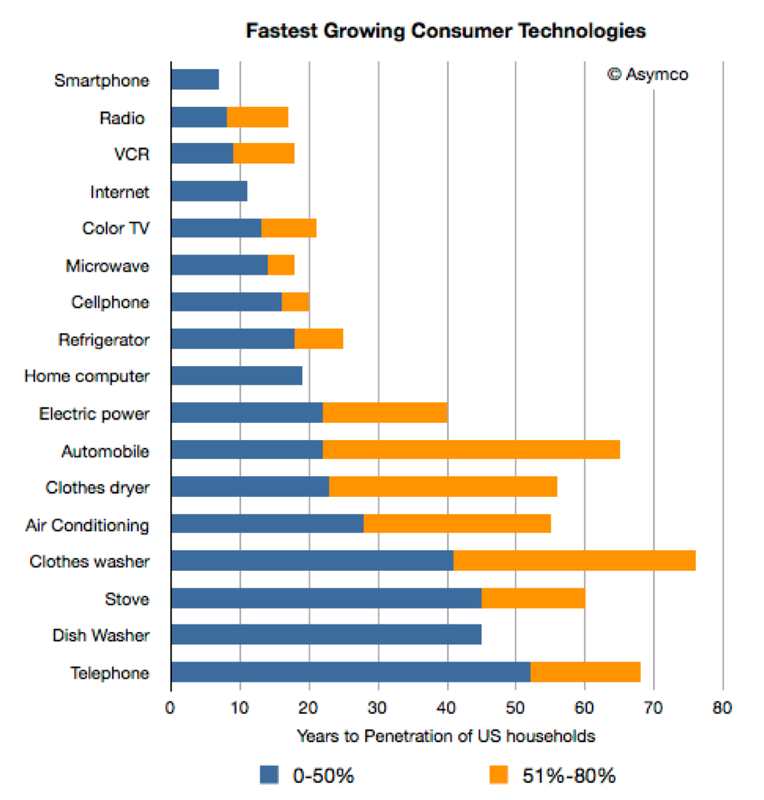 Rapid developments in information technology since the early 70s had corporate America particularly excited. Theoretically, the applications of spreadsheets and databases were limitless and had the potential to make workplaces magnitudes more efficient, increasing productivity dramatically. However, as with the dynamo, it didn’t quite happen that way. Where the effects of innovation on society are difficult to gauge, economists will use a metric called “total-factor productivity” to capture the portion of change in output not explained by changes in input. This measure essentially reflects how well fixed inputs are being used in production. 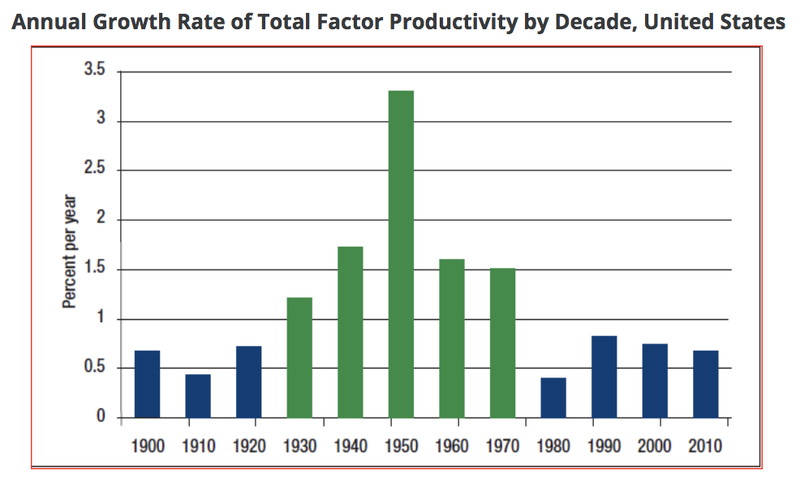 Through the 80s, total-factor productivity in the United States grew at its slowest rate since the Great Depression, despite rapid adoption of computer and IT innovations. Like any paradox, it begged the question: why? The problem was that, again, they were doing it wrong. Simply installing computers would not be enough on its own to take advantage of their potential. It was just like putting a dynamo in place of the central engine in a steam-powered factory — a measure doomed to fall short of expected payoffs unless accompanied by a broader reshuffling of the way technologies were being put to use. Over a decade later, in a paper published in 2000, economists Erik Brynjolfsson and Lorin Hitt analyzed the paradox, only to find there was nothing incongruous about it. 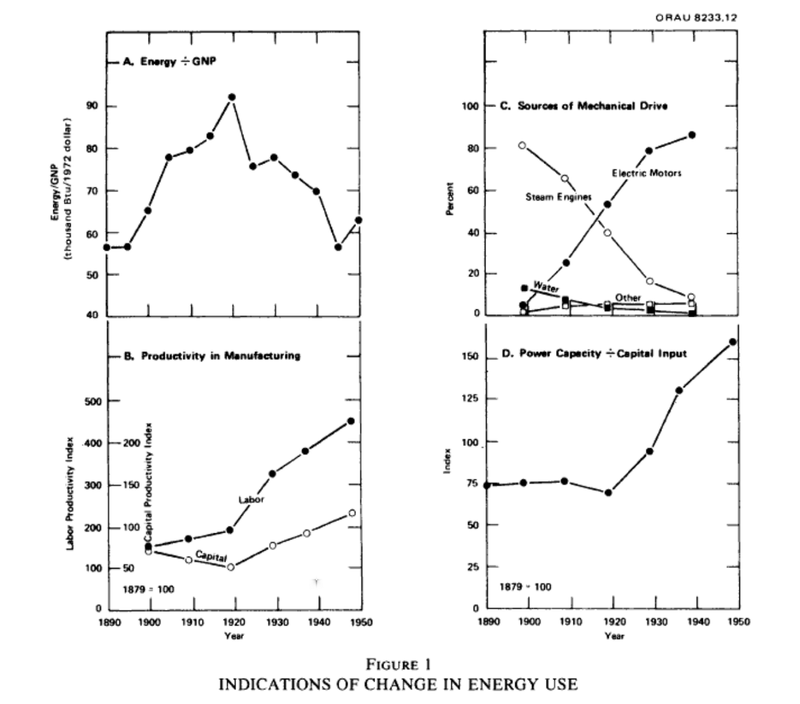 Among the hundreds of companies the pair considered in their research, many actually had significantly increased total-factor productivity by implementing computer systems. The difference between these success stories and their disillusioned counterparts was implementation. Companies that expected the simple act of placing a computer on a desk to impact their output while keeping all other variables constant were wasting resources. Brynjolfsson and Hitt found in their research that restructuring organizations to effectively utilize distributed data systems and streamline supply chains was the answer to making computers “work.” Ultimately, these practices caught on, activating, at last, the potential of the modern computer while reshaping the way American companies function. Not long after the computer age finally showed up in the productivity statistics, Vinton Cerf and Robert E. Khan’s TCP/IP suite of protocols was adopted by its first major corporations — AT&T and IBM — setting in motion the sequence of events that effectively created the World Wide Web as we know it today. The resulting Internet was built in a way where computers could uniquely identify themselves, but humans could not. At the time, this didn’t raise any red flags. We created “accounts” as stand-ins to represent us online. These were guarded by passwords, requiring us to “log in” as our digital selves to interact with people, devices, and services using IP addresses as session identifiers. This fundamental structure and the rituals of authentication surrounding it became the bedrock of our method for using the Internet. Today, it is clear that we’re missing something. The status quo is not sustainable. Our identities have become extremely fragmented, spread out over the ever-growing number of services we interact with, and we are losing control. As of 2017, the number of accounts per average business email was 191, and that amount is on track to double in the next 5 years. Because no one has the brain space to reasonably keep track of that many individual credentials, people have gotten lazy. In 2018, 55% of online users reported using the same password across most, if not all, major accounts. Unfortunately, this shortcut has come at the expense of users’ own security. In addition to the mounting friction they bring to our daily lives, rituals of authentication increasingly leave us vulnerable to malice. As long as our identity is something we must log in through the Internet to access, our data will live somewhere among millions of other people’s data in a centralized “cloud” or “treasure trove.” These repositories of sensitive user information are targets for hackers. The more services we interact with, the more clouds our credentials necessarily live in. Our individual attack vectors multiply with each new account we create, exposing us further to the risks of data compromise and identity fraud. Massive breaches and abuses of user data have become disturbingly commonplace over the past decade, resulting in millions of identities being compromised and amounting to millions of dollars in damages. In this climate, companies such as Google and Facebook have dedicated efforts to unifying the login experience with Google Sign In and “Login with Facebook.” Independent security players have also thrown hats in the ring, launching password management tools that make accessing our fragmented identities a bit easier. Unfortunately, these are all Band-Aids and not permanent solutions. No centralized treasure trove of user data is immune to attack — it’s always only a matter of time. To truly solve the Internet’s underlying authentication problem, something has to be done about the missing identity layer that’s causing it (and fast). We now stand on the brink of what economists have been calling the Fourth Industrial Revolution. Building on the advances made in automation and digitization during the Digital Age, this new era is expected to be different from any revolution we’ve seen before. For the first time, economists are anticipating a wave of progress distinguished not as much by technology as by communication and connectivity. Ushering in this new age are innovations on multiple fronts, including robotics, AI, nanotechnology, and the Internet of Things. Underpinning them all, of course, is that beautiful network that started it all, the Web. According to the World Economic Forum, the advent of “cyber-physical systems” expected to characterize the Fourth Industrial Revolution will bring about “entirely new ways in which technology becomes embedded in societies and even our human bodies.” Examples include genetic engineering, machine intelligence, and new approaches to governance that rely on cryptographic methods such as the blockchain. As we enter IR4, the capabilities of the web brought to us by IR3 continue to mature and expand globally, finally taking root in less developed parts of the world. This means we’re in for a massive influx of nodes to our networks. The way we’re trending, our infrastructure won’t be able to handle it. We face the threat of a “connectivity paradox,” where despite the unprecedented potential for global exchange and connectedness, the unsolved authentication problem limits our ability to leverage this capacity. Changes in identity infrastructure at the lowest level are needed to address this threat. The good news is, as far as GPTs go, we’re pacing just fine. When the dynamo was as old as the Internet is now, factory owners were still investing in steam engines. At Token, we believe that the unsustainable and insecure way in which we identify ourselves on the Internet can be fixed. Combining asymmetric cryptography with biometrics and the miniaturization of wearable devices, we’ve found a way to close the Pandora’s Box of fragmented identity, and we’re working to bring it to life. We are determined to shape a system in which the Internet can serve its intended purpose — connecting us to one another. Starting with a ring that unifies the way we prove who we are to the people, devices, and services we interact with today, we’re committed to building tools that people can use to identify themselves and own their data on the web so we can all participate safely and easily in the expanding global network. Sign up to get notified when Token launches at www.tokenring.com. Token unifies the way you prove your identity to the world — live free of keys, cards, badges, and passwords.